In 1951, somebody – who knows who it was? 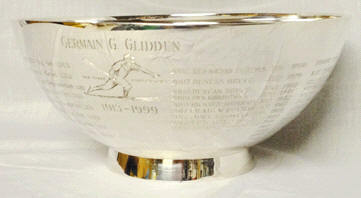 – donated a Sterling Tiffany Bowl to the Club, and every year since then Germain Glidden, and now we of the Board, have had the Bowl engraved each fall with the Batting Contest Winner’s name, winning average, and year. When the engraving for 2018 was completed, we realized that the Bowl was entirely out of space for future engravings. After much thought and a protracted search, we purchased a new Sterling Tiffany Bowl. It’s slightly larger than its predecessor, and it is engraved with the Club symbol, which Germain Glidden drew of Lou Gehrig in 1927. 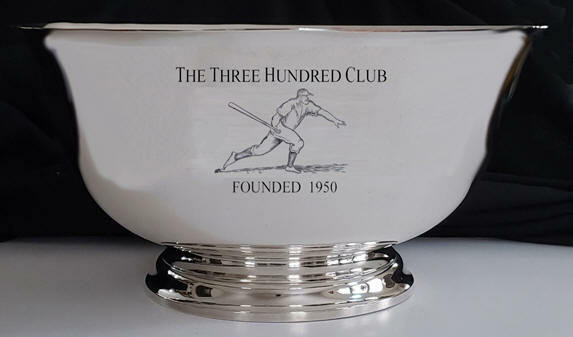 Beginning this year, the Bowl will be engraved with the name, year, and winning average of the Club’s Batting Contest Winner, and it will be presented to the Winner for the following year, along with a 6” Pewter Bowl, similarly engraved, which the Winner gets to keep. Just as always. The new Three Hundred Club Bowl is handsome, genuine, elegant, and worthy, we feel, to carry on the great tradition of the Club, and we are excited to open the 2019 season with the challenge to one and all to “pick ten batters whose sum total average at the end of the regular season will be higher than any ten anybody else can pick,” and be the first Winner of many years to come for the new Bowl! We’re therefore pleased to announce that the Club Website is open for Ballots, the 2019 Season is underway, and the Three Hundred Club Bowl is up for grabs for the 69th consecutive year! Club dues are $75 for returning Members, and $75 plus a one-time Initiation Fee of $25 for new Members. As always, existing Members who sign up two new Members play for free. Prizes remain the same at $750 for the Batting Contest Winner ($150 at Midseason); $150 and $75 for Homers and Pitchers; $150 for RBIs and Stolen Bases, and $100 for the Dimaggio Prize. We also award a $25 prize for the highest batting average each week. 1) Please go to the website, log in, and update your personal info, including your email and mailing address. CALL US if you forgot your login/password. We NEVER release Members’ info. 2) The Balloting section is open. Please enter a Ballot NOW. You can change your Ballot up 'til Midnight of the Deadline. (Only you can see your picks until after balloting is over). Members who start their Ballot now tend to make final picks by the Deadline and not forget. Payment isn't due until then. However, we recommend that you pay dues now so you can see your Ballot in weekly rankings. 3) SHOW THE SITE TO A FRIEND! It’s easy to register on the Site, select a Ballot, and make changes whenever you wish. Remember, Ballots are only ranked after payment is received, so there's no charge if someone fills out a Ballot and later decides not to play (although we can't imagine why). 4) MARK YOUR CALENDAR NOW! The 2019 Balloting Deadline is Midnight, Monday, May 13. We will send out email reminders as the Deadline (just a month from now) draws near. We hope all will play in 2019. We welcome new Members, and we look forward to the weekly winners, the midseason winners, the "perfect ballot," the individual contest winners, and the Grand Prize Winner at season's end. May yours be the best Ballot ---after mine!